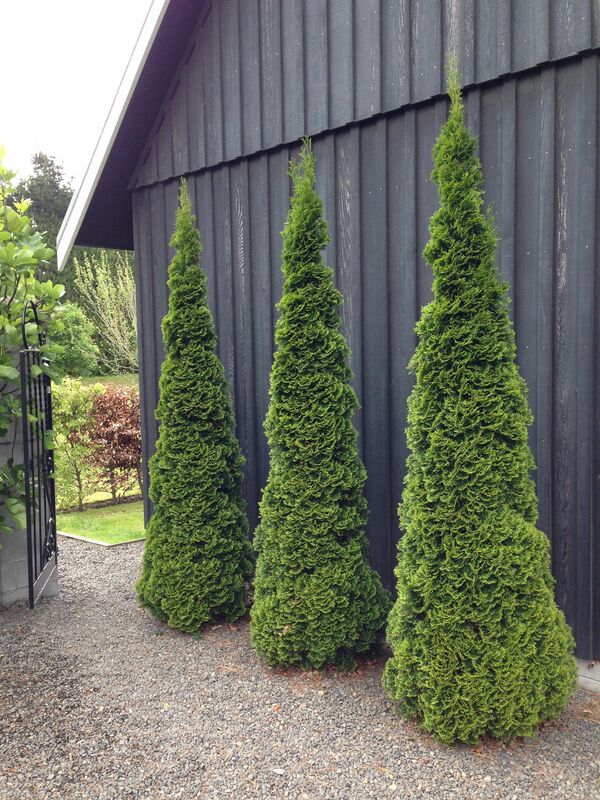 This next garden in the series of blogs about the Taranaki Garden Festival is very different to the previous two. 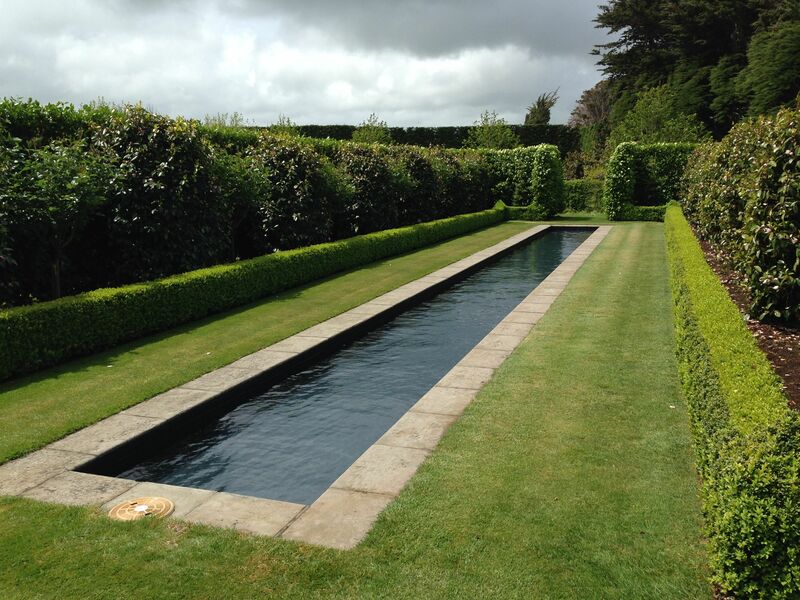 Highly planned, highly manicured and equally loved by its owner, Gravetye is the ultimate photogenic garden. In fact, so much so that it was recently featured in Home and Garden magazine. 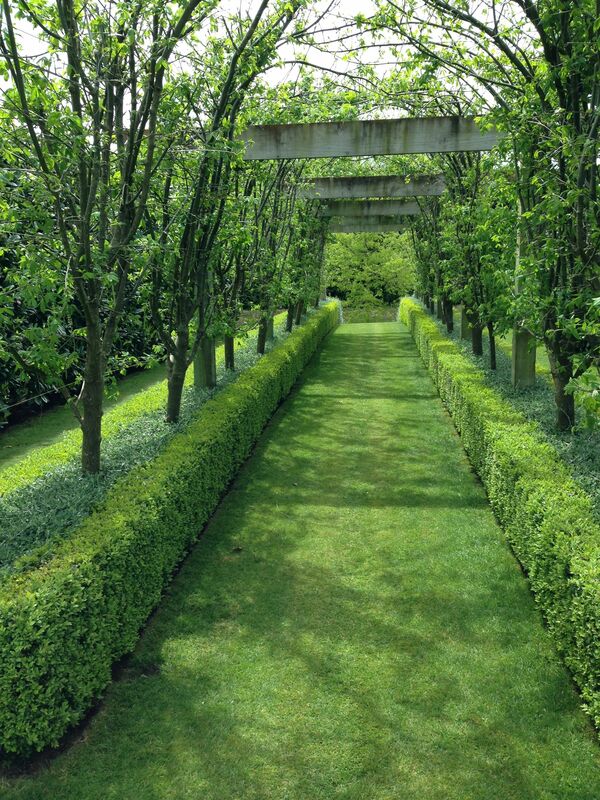 It is a garden of clean lines and symmetry. Every corner you turn opens up another long vista of neat Buxus hedges and avenues of meticulously pruned, evenly spaced trees. It was one of the most verdant gardens we saw at the festival, just green, green and more green, everywhere you looked. It was lovely that most pathways were grassed; had there been too much hard landscaping the formality of this style of garden could be quite austere and harsh, particularly out in the countryside. I dread to think of the time spend mowing and pruning here, but the area does at least have plentiful rainfall on its side to reduce the time spent irrigating! I was delighted to see that the formal design did not prevent some surprises and creativity being integrated into the garden. This tapestry hedge was absolutely stunning. 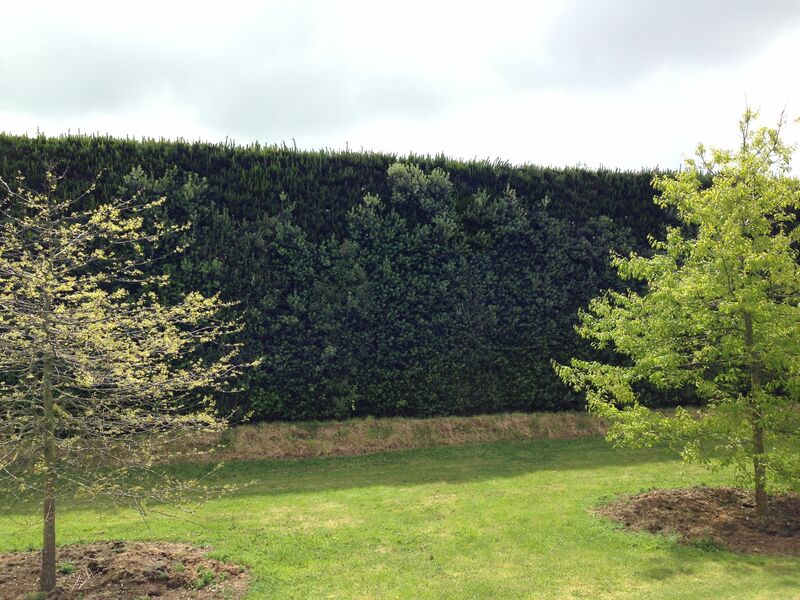 The photo doesn’t do it justice, but essentially it is a tall conifer hedge, with different species of shrub filling in the lower sections. The uniform top ties the whole extensive length of hedge together, but the lower species add shape, texture and colour contrasts. I think it is the nicest hedge I have ever seen! I wonder if this look will be maintained as the lower shrubs continue to grow. 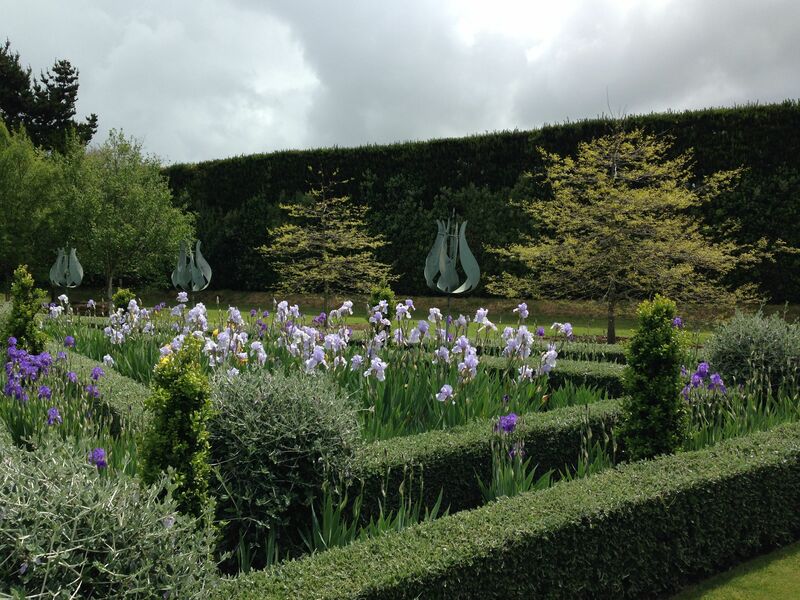 I admit that I sometimes find very formal gardens a little too controlled, a little too far removed from nature. However, a well planned structure is always an asset and applied in the right way, formality need not be static and uninteresting. A formal layout, softened with varied and colourful planting was a very popular style adopted by Lutyens and Jekyll in the twentieth century and this section of meadow reminds me of the beauty of neat structure with soft planting. 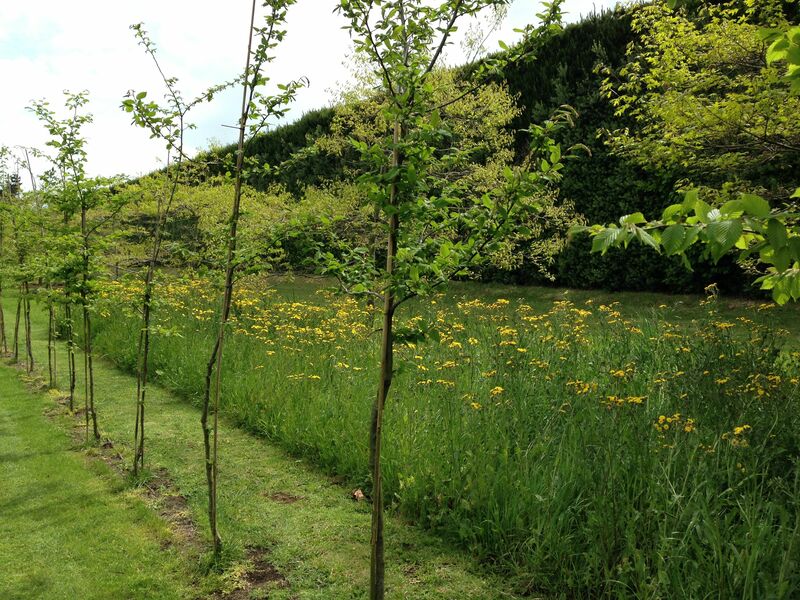 It fits perfectly with the straight lines of the rest of the garden and yet the relaxed planting adds a whole new dimension. Gorgeous! 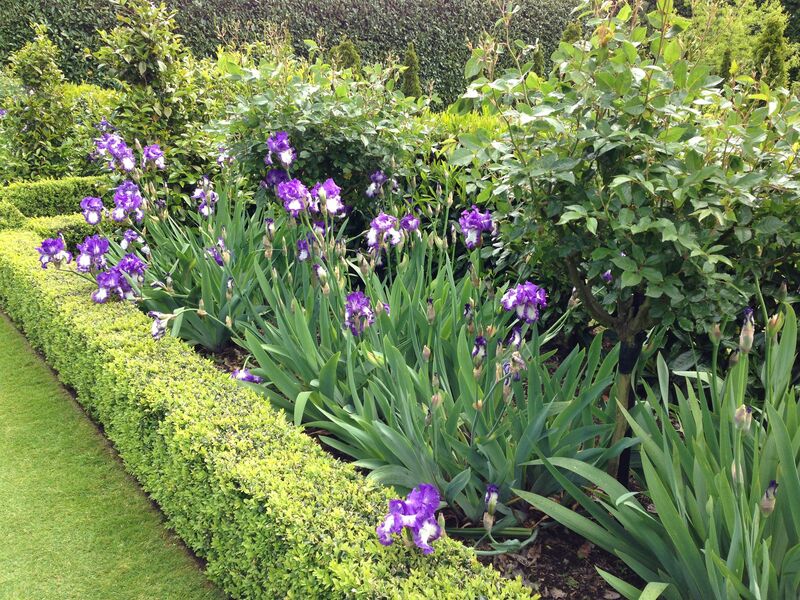 Throughout the garden, the colour palette is very restrained and the simplicity works well. 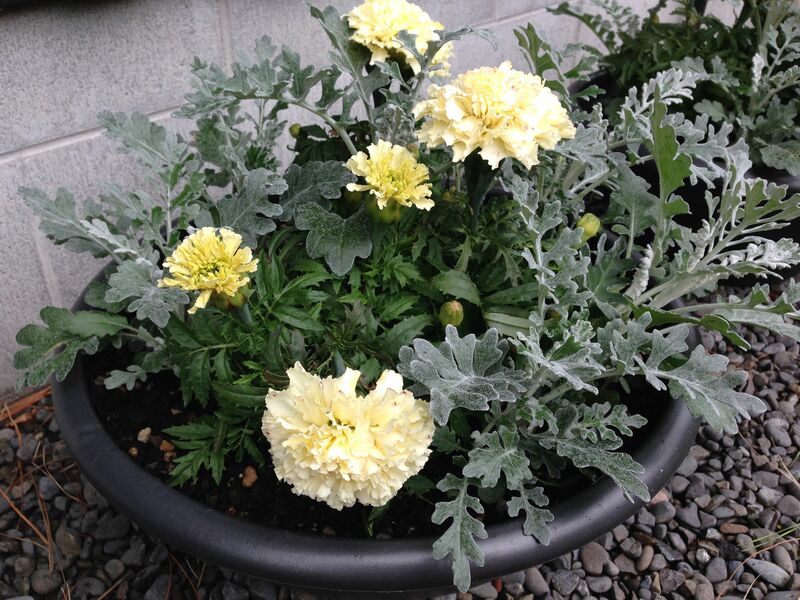 This pot is a perfect example of that. 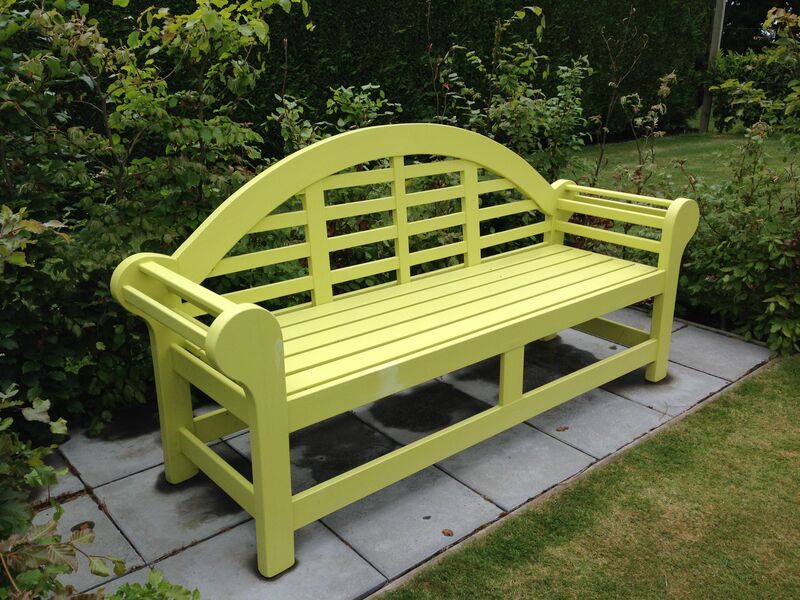 I also loved the colour of this bench. It may go out of fashion over time but in 2014 it is perfect. 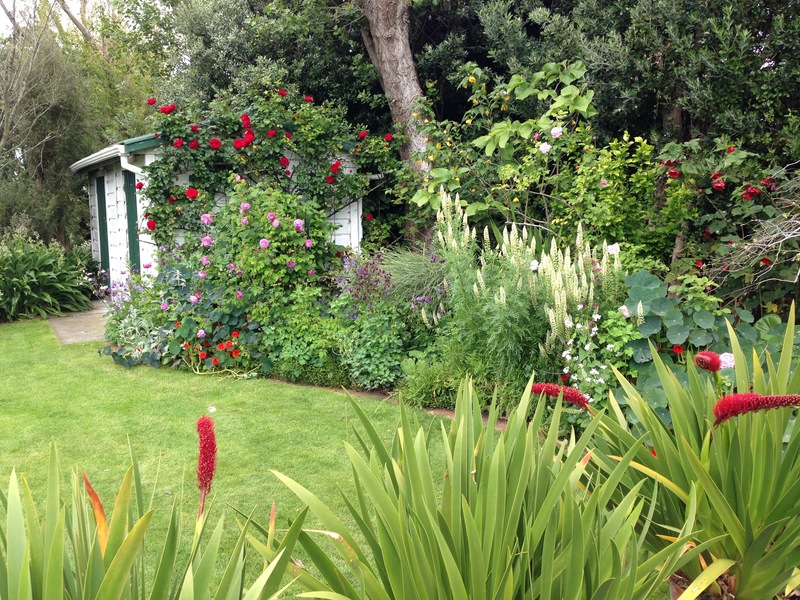 It blends with the very green overall look of the garden, whilst lifting the colour scheme and adding interest and fun. Every aspect of the property has been thought through and is pleasing to the eye. I felt that the little pockets of interest and fun were what really made this stunning garden. 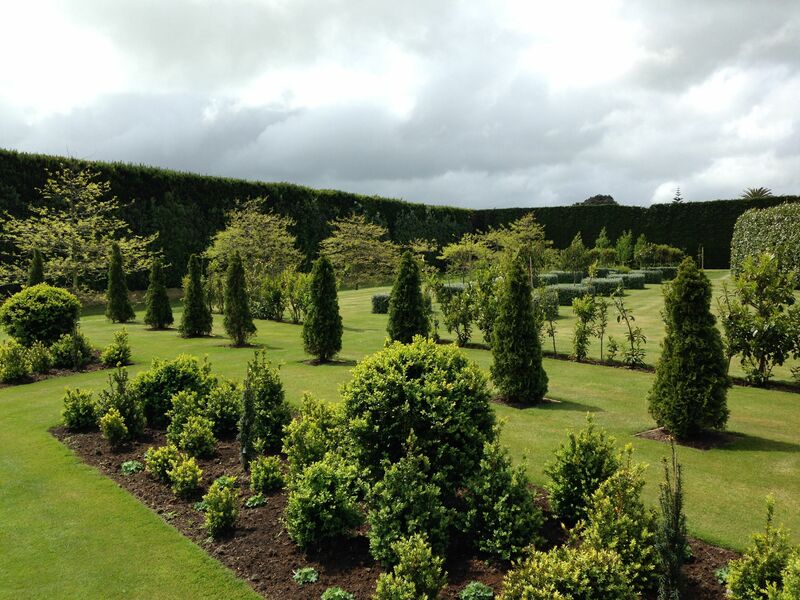 Formal gardens can lack character, but with individual touches injected in, they can be beautiful and serene, just like Gravetye. 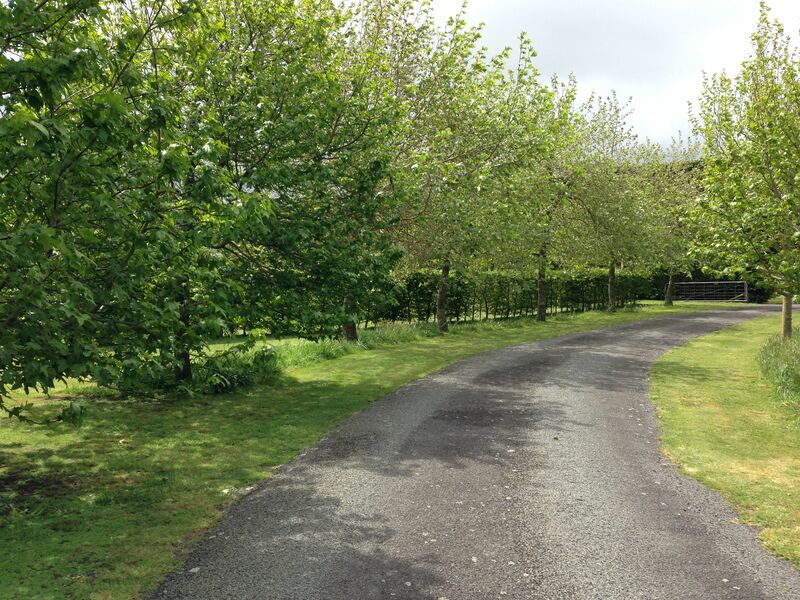 The curving driveway up to the more formal garden. I could have easily been in England! 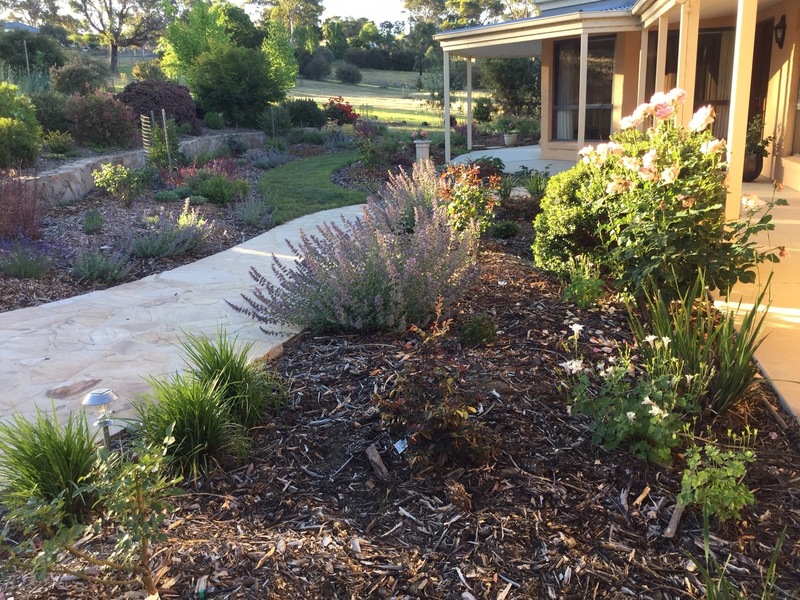 Interesting garden – would like to see it in 5 years or so. Not a fan of trees in lines but it probably makes more sense in ‘real life’. What is the species used for the tree arbour – do you know Janna? I can’t make it out – that looks good — Laburnum perhaps? Yes, good spot, the arch is Laburnum. I know a lot of us like to have a bit more variety and fluidity in a garden, but this was undeniably beautiful. It’s lovely to see different types of garden.